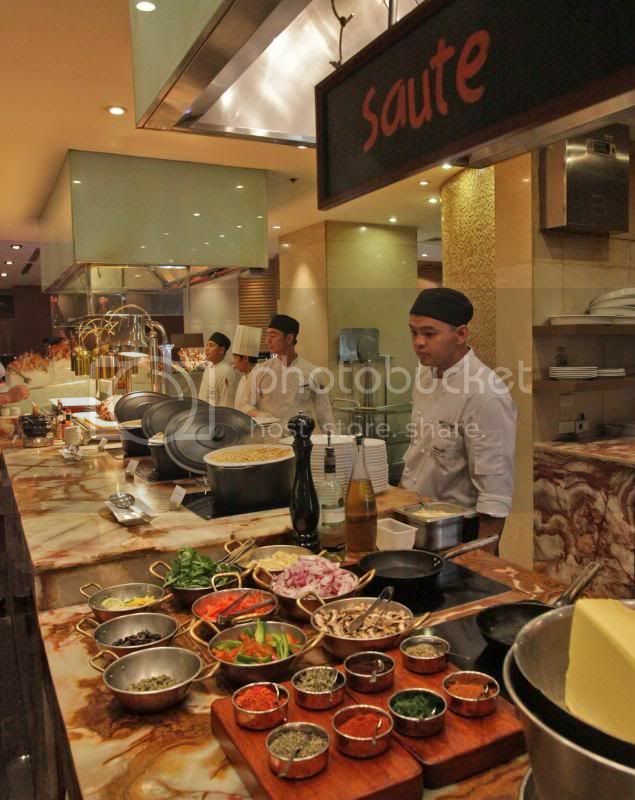 It takes a gourmet treat at Marriott Cafe to rejuvenate this blog. 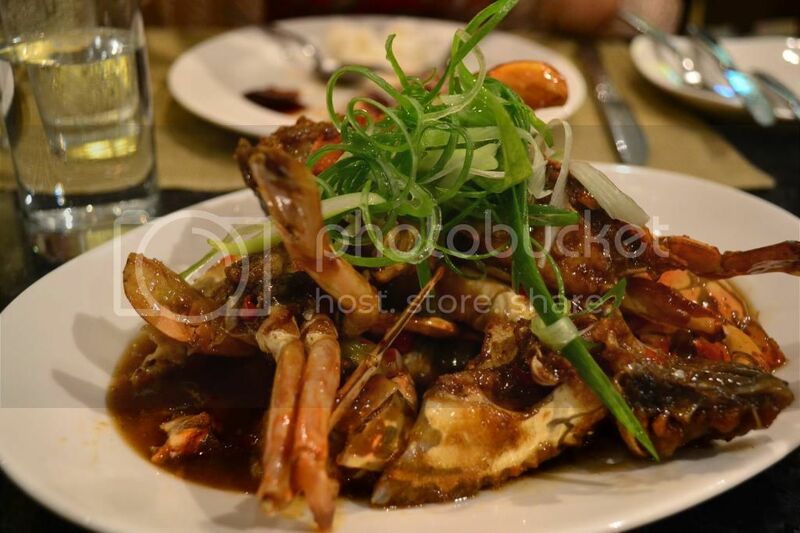 How could I resist a dinner with lots of seafood, which I can have cooked my way? Chefs standing by and happy to cook seafood dish your way. 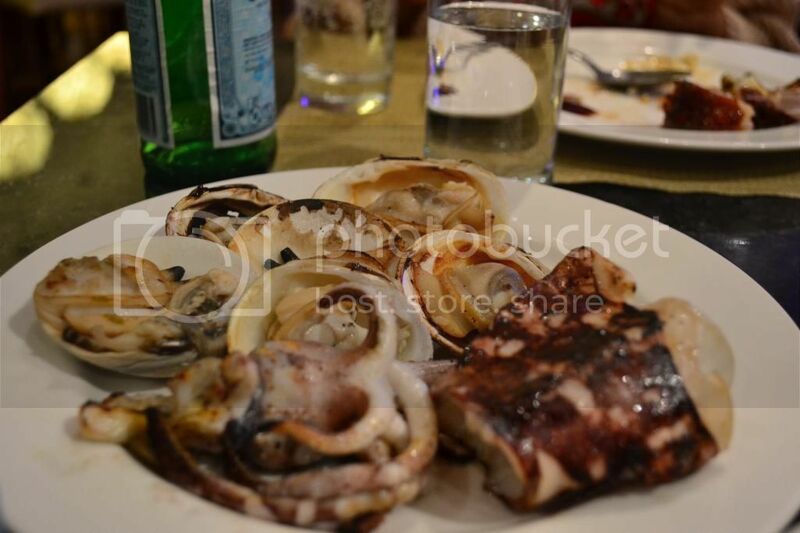 I grew up from the country's seafood capital, Iloilo. Fresh seafood was an everyday fare and they didn't come expensive, too. I know how seafood dishes should taste like, even if they're prepared simply. That is the come on for Marriott Cafe's Ocean's Harvest. For only P2,300, I can have seafood to my heart's content. Since I could request the chef how my shrimp or scallops, fish or even the lobster should be cooked, I opted to go simple. I ordered a pampano with only the soy sauce and herbs. It didn't disappoint. 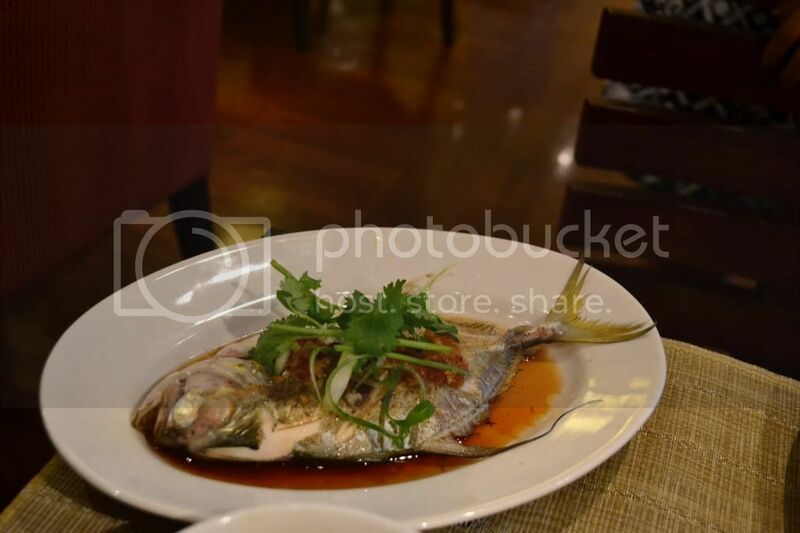 The fish was tender and fresh, and it brought me back to my mother's kitchen in Anilao, Iloilo. There is more than the pampano for your choices. 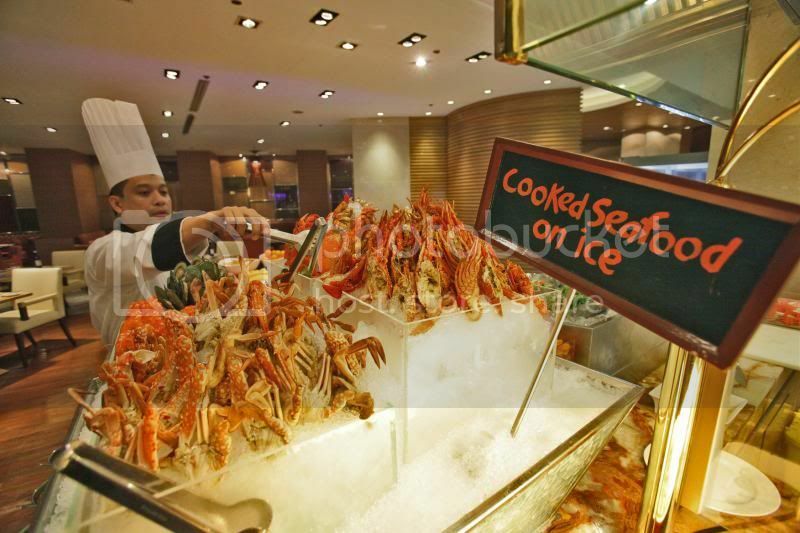 The Ocean Surf Market Style Buffet Menu includes fresh salmon, tuna loin, local tanigue, talakitok, lapu-lapu, maya-maya, shellfish, jumbo prawns, half shell local scallop, local clams, jumbo squid, suahe shrimps, blue marlin, and local gindara. You can also have your fill of slippers lobsters, local blue sea crab, curacha crab, prawns, mussels, and white shells. Just look at all of this at your disposal! Here is my other plate of assorted grilled seafood. 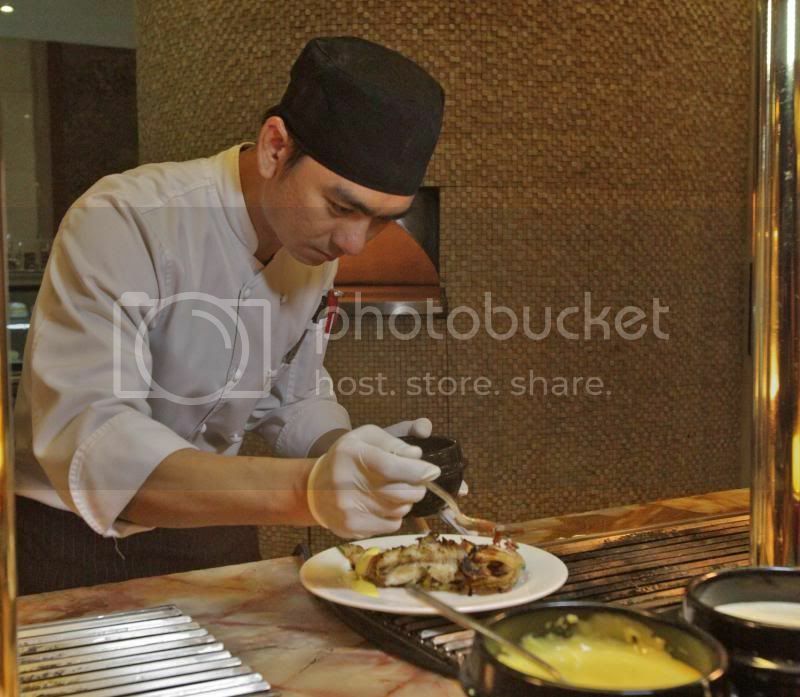 Chef prepares grilled lapu lapu and adds a dollop of Bernaise sauce. And the ultimate sweet and sour crabs! You shouldn't miss this Ocean's Harvest offering at Marriott. 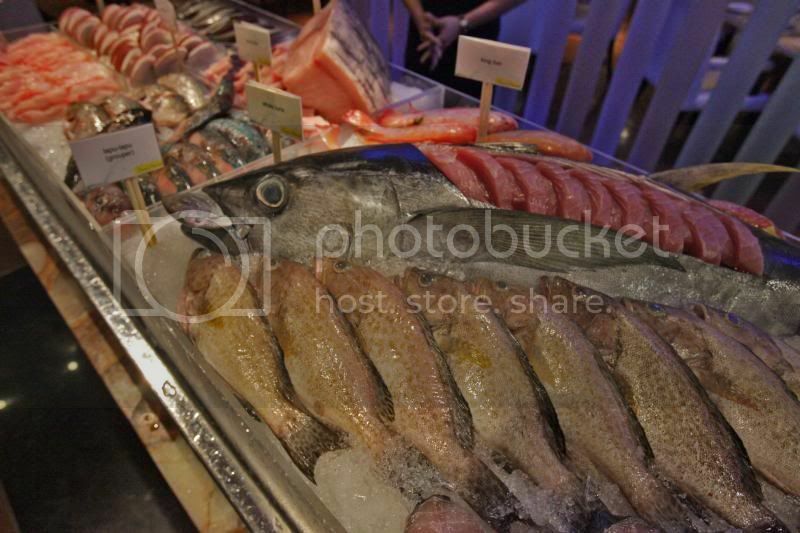 This Ocean Surf Market Style Buffet is open every Friday and Saturday nights from 6:00PM to 10:30PM. If you are watching what you eat, you can have this fresh seafood with fresh vegetables at the salad station. Waiting for you is a feast of greens and dressings specially made with options such as lobster and pomelo, brocolli and blue crab, seafood with mushroom and mango salad in honey mustard, lapu lapu ceviche, and local scallop asparagus and orange salad. Marriott Café. For inquiries or reservations, call (02) 988-9999. An inviting beacon set in the world-class casino entertainment complex of Resorts World Manila, Marriott Hotel Manila is the place to work and play. Ideally located in Newport City across Ninoy Aquino International Airport Terminal 3, it is a convenient 15 minute drive from Makati Business District and Bonifacio Global City. Affording a splendid view of the adjoining 18-hole Villamor Golf Course, it boasts 342 exquisite guest accommodations that offers luxurious bedding, in-room safe, mini-bar, high-speed Internet, air conditioning, 40" full high definition LCDs with IPTV, videos on demand and jack pack plug-and-play system. The hotel features excellent dining options such as Marriott Cafe, Cru Steakhouse, Java+ and Lobby Lounge. Leisure facilities include Quan Spa, Health Club, Salon and Newport Mall. With a Grand Ballroom and several meeting rooms, Marriott Hotel Manila is also the ultimate destination for meetings and events, from wedding to gala dinner celebrations.